Apple Music is a streaming music service. In other words, all the songs on Apple Music are protected in DRM and can’t be downloaded for offline listening. 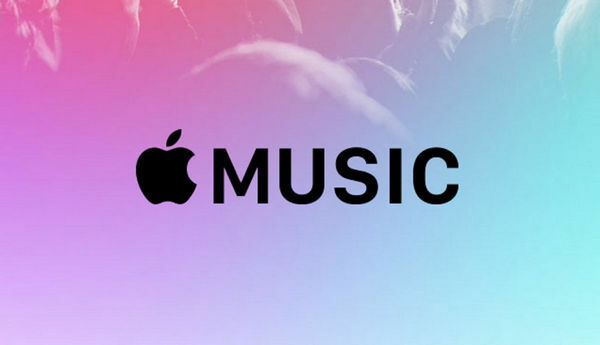 We have access to listen to Apple Music by paying monthly fee. But once we cancel the service, all the Apple Music we used to listening to will not be available any more, including the alleged “downloaded offline” music, which are saved temporarily for Apple Music members to play the songs offline within subscription, instead of being downloaded to our local PC or Mac. This tutorial is going to teach you a good way to make Apple Music available offline on your Windows or Mac OS forever. Why is Apple Music not Available Offline? DRM, short for Digital Rights Management, is an access control technology, which Apple Music adopts for restricting the distribution of copyrighted works. Therefore, we can’t download any songs from Apple Music for offline listening. However, if we can remove the DRM from Apple Music, we will be able to make Apple Music available offline easily then. 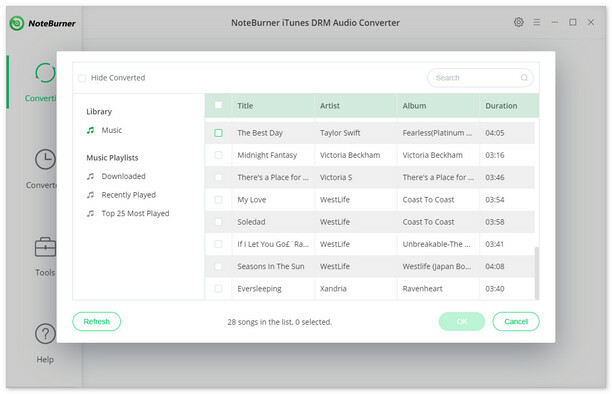 Next we are going to introduce a powerful Apple Music DRM removal tool – NoteBurner Apple Music Converter and guide you to play Apple Music offline step by step. 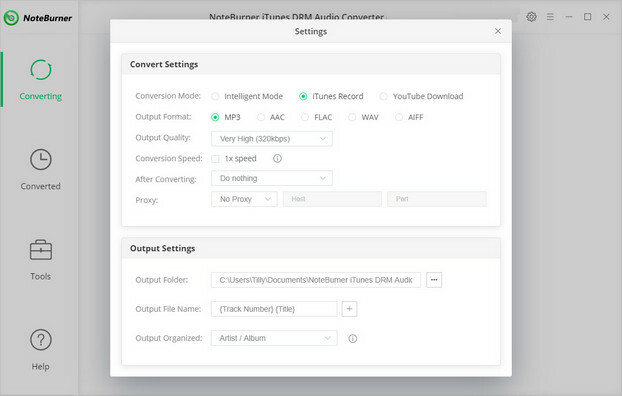 NoteBurner iTunes DRM Audio Converter is well-known for being an all-in-one music offline downloader of Apple Music, iTunes M4P Music and Audiobooks. Mostly people apply it to convert Apple Music, for which a great number of NoteBurner fans call it Apple Music Converter. As mentioned above, NoteBurner Apple Music Converter supports both Windows and Mac OS. Here we will take Windows version as an example to show you how to stream Apple Music offline. Note: For Mac users, please refer to Download Apple Music on Mac for detailed steps. Click button "+" on the upper left. A pop-up window will show you all your music downloaded in your iTunes Library. Choose the Apple Music that you want to convert for offline listening and then press OK.
Click the gear button on the upper right. Here you can customize Output Formats ( MP3, FLAC, AAC, WAV), Output Quality as well as Output Path. Click button "convert", and all the Apple Music you chose in step 2 will soon be converted to the DRM-free format you selected in step 3 and downloaded & saved offline to your local PC. When the conversion is done, you can find all the converted DRM-free Apple Music by clicking the history button on the upper right or directly going to the output folder you customized in previous step. Now you can enjoy Apple Music offline anywhere anytime.